Are your customers engaged? It’s a question many in the financial industry are asking themselves lately. In the age of fintech disruption, it’s more important than ever for financial institutions to reach out to customers, to make them feel valued, and to give them reasons to give you more of their wallet. It’s an opportunity for growth and a way to build, and in some cases, rebuild, relationships with the segment of their customers who are at risk of falling away. Who are these customers, and why are they disengaging? At Deluxe, we wanted to find out. That’s why, in January 2018, Deluxe Financial Services commissioned Forrester Consulting to look into what’s going on with those unengaged financial consumers. The complementary report, entitled Reward Your Unengaged Customers: How Loyalty Programs Can Reinvigorate Your Relationship with Your Lapsed Financial Customers is available to download today. First, let’s define what “unengaged” means. It’s a customer with active accounts, either checking, savings or credit card (or all three) but for varying reasons, they have not made deposits, withdrawals or payments through them for the past six months. Forrester conducted an online survey with 1,016 respondents in the U.S. who are unengaged with their financial institutions. What they found might surprise you. Are middle aged (between 49 and 52 years old) and vary across income and education levels. Have had an established relationship with their financial institution for more than 10 years. While a relationship exists, it has either weakened with time or was weak from the beginning. Are not unengaged because of negative experiences. This is a clear matter of customers being “un-tended to” by financial institutions. Are not completely inactive — they are just not making deposits, withdrawals or payments. 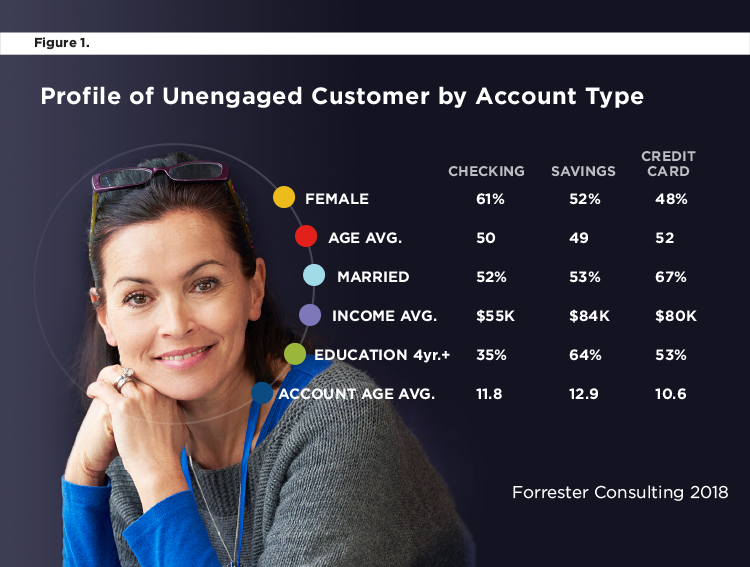 The unengaged have not abandoned their accounts altogether; many continue to keep up with account activity via email, and checking or savings customers occasionally interact via a physical location such as an ATM or the local banking branch. Will become an increasingly large portion of financial institutions’ customer bases. Forrester estimates that 16 percent of financial consumers among the top 35 financial institutions (by 2017 annual revenue) in the U.S. are unengaged consumers. And with the increasing trend of consumers turning to fintech disruptors, Forrester projects that unengagement will steadily increase to 19 percent of all three types of accounts by 2022. Don’t dislike their primary financial institution — they just don’t feel that they have a reason to engage more. Oddly enough, most unengaged customers are highly satisfied with their primary financial institution. But because they don’t have a reason for deeper engagement — either the financial institution hasn’t offered one or they have found another that is offering better transactional benefits — only 28 percent or less of the unengaged feel committed to opening any new accounts in the future with their primary financial institution. Are key targets for competitors. Better rates from fintech startups and other offers can and will lure these customers away if you don’t give them a reason to stay. In a way, it’s like any other relationship. If you don’t tend to it, make the person feel valued and appreciated, and even rewarded from time to time, you risk losing it to someone who will. Results from this study indicate that the steady growth of this segment over the next five years represents an escalating problem for financial institutions. Only by giving these customers a reason to engage can financial institutions ensure that they do not miss an opportunity to capture their future dollars. If you are trying to re-engage clients, there are very few options outside of offering a better rate, which for most is not a popular option. When it comes to engaging the unengaged, Forrester reveals that rewards from loyalty programs are among the top engagement triggers and they are an excellent way to re-engage clients without offering them better rates. Loyalty programs are a key pillar in the overall loyalty strategy that’s focused on building the total customer relationship, customer engagement and advocacy. Better rewards or better discounts. Who doesn’t want that? Special offers for existing customers. Extra points for demonstrating engagement behaviors such as rewarding signing up for and receiving paperless statements or email newsletters. Discounts or more points for charging purchases and use of their credit card. Points or benefits designed to develop positive and profitable habits that drive the behaviors you value most and incentivize cardholders to engage frequently and consistently. Incentives for cardholders that engage in everyday activities that unlock valuable benefits or discounts. An experience with offers and rewards that are curated and personalized to the cardholder. A better interest rate for bundling services like credit cards and savings accounts. Bottom line, consumers want to be valued for the entire relationship they bring to their financial institution. And the bigger share of wallet you have, the more loyal that customer can become. Re-engage these customers by leveraging their full relationship. Show them the value you give them while letting them know that all their active accounts and engagement behaviors are impacting those rewards.